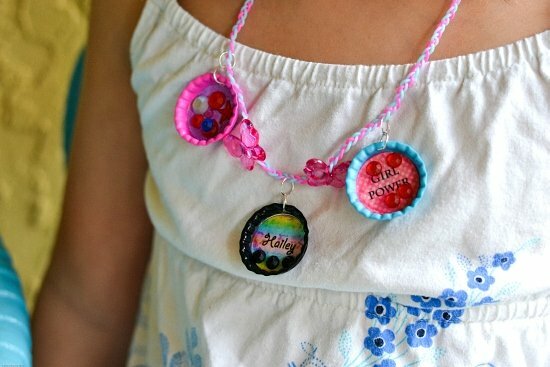 Get crafty with this easy Bottle Cap Charm Necklace. These bottle cap charms are easy to make with just a few supplies. You can hang them on a simple necklace or put a magnet on the back and stick the kids mini art work up on the fridge. Back to School has got to be one of my favorite times of year to shop. I love shopping for back to school supplies at Target for the kids and for myself. I stock up on supplies in a big way. I also keep my eye out for school supplies that my granddaughters might need. Elmer’s and Wet Ones have teamed up to offer the perfect back to school craft and clean up combo package available only at select Target locations. You will find these special Elmer’s Glue & Wet Ones wipes in the Back to School section of select Target store while supplies last. 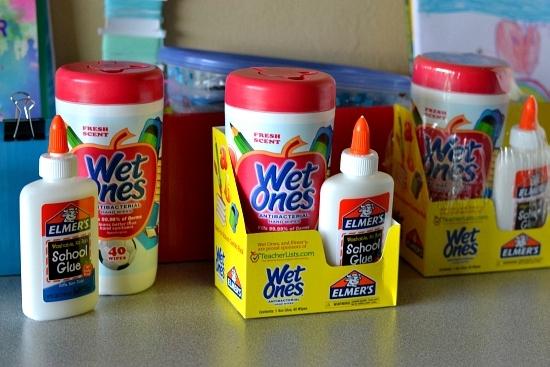 You can buy a bottle of Elmer’s School Glue and a container of Wet Ones antibacterial wipes for under $3. The price was a deal breaker for me so I picked up four packages. The grandkids will each be taking a package to school with the rest of their school supplies. I’ll be keeping the other packages for our craft area. Crafting with Elmer’s Glue can get a bit messy sometimes and having a handy container of Wet Ones right there on the table so the kids can wipe the glue off their fingertips makes it so much easier to keep our little craft center clean. This year will be the second time I have two kids starting school at opposite ends of grade levels. The first time was when my oldest daughter started the 12th grade. That year my youngest daughter started kindergarten. This year I have my youngest daughter starting the 12th grade and one of my granddaughters starting kindergarten. Wow that really blows my mind when I stop to think about it. That granddaughter is Emma , my son’s daughter who lives with us half of the week. My oldest granddaughter Hailey hangs out at our house almost every weekend so she can play with Emma. Since school has been out for summer vacation Hailey has pretty much moved in on the days Emma is here. 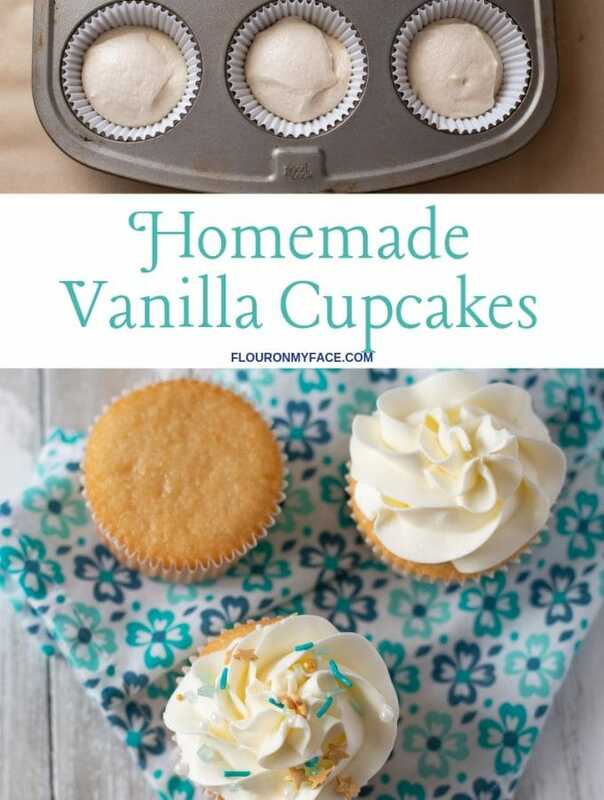 All the girls in the family are very creative so I am always looking for easy summer craft projects that they can do. It helps keep them entertained. I decided Hailey needed a little Grammy time so I created a sheet of 1 inch circles with pretty colored backgrounds, quotes and her name and planned a craft day for her during the week before her cousin Emma came over. We made Emma a necklace too so she wouldn’t feel left out. You can download and edit this bottle cap charm printable in Microsoft word. Add your childs name to a few circles or change the quotes. 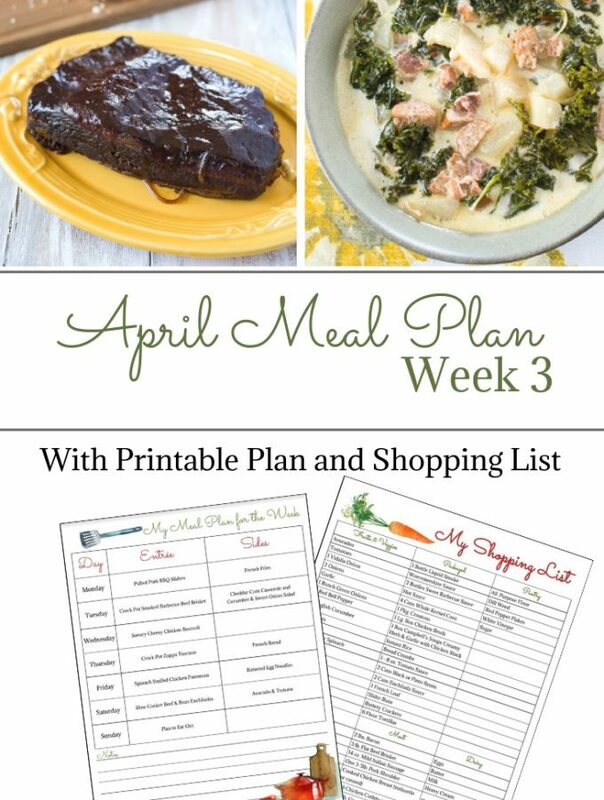 The template is best print out on cardstock. These are some of the supplies I used and some ideas for items that can be used. You can get creative and use any craft supplies you have on hand that are small enough to fit inside the bottle cap. 1 package colored bottle cap charms ( bought at Michael’s) with holes for stringing on necklace string. Punch the 1 inch circles out from the bottle cap charm printable or punch 1 inch circles from pretty scrapbook paper, construction paper or any heavy type of paper can be used. This would be a great recycling project also by using paper that would normally be thrown away for the backgrounds. 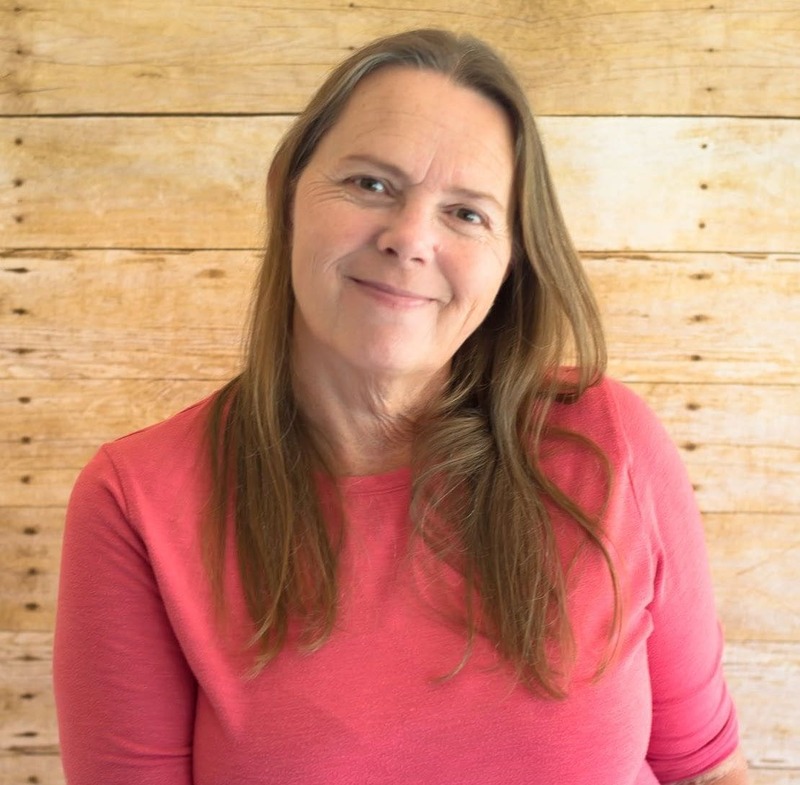 Have your child glue the paper to the center of the bottle cap by putting a dot of Elmer’s glue on the backside of the 1 inch circle, placing it into the center of the bottle cap and smoothing the glue out with a finger. Compile all the embellishments on the table or in a craft container so they can pick and choose which ever embellishments they want to use to decorate the inside of the bottle cap charm. 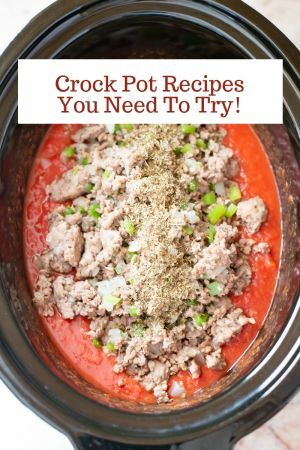 Giving them a few choices will help them get their creative juices flowing. Have them place a small dot of Elmer’s school glue on the backside of the embellishment and place it in an area inside the bottle cap charm. Guiding them to decorate around any words that may be printed on the background paper. 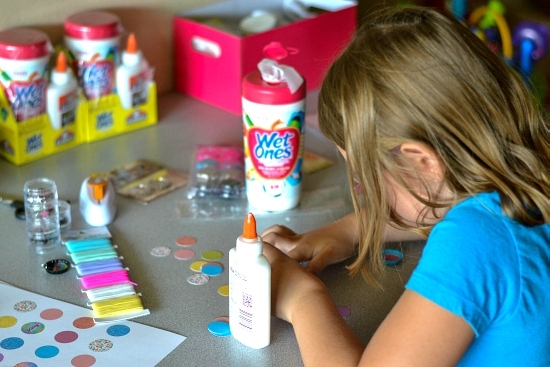 Once the kids are done decorating their bottle cap charms to secure the embellishment to the background paper paint a thin layer of Elmer’s glue over the inside of the bottle cap charm. Set aside for a couple of hours to let the glue dry completely. Once the glue is dry add a metal jump ring to each bottle cap charm. Hang the charms from necklace string, elastic necklace string or even yarn will work. Add other plastic beads if desired. You can tie the necklace string together in a double knot just make sure it is long enough to go over the childs head. Or you can use a jewelry clasp to close the necklace. I happen to make jewelry so I have things like jewelry findings in my craft supplies. 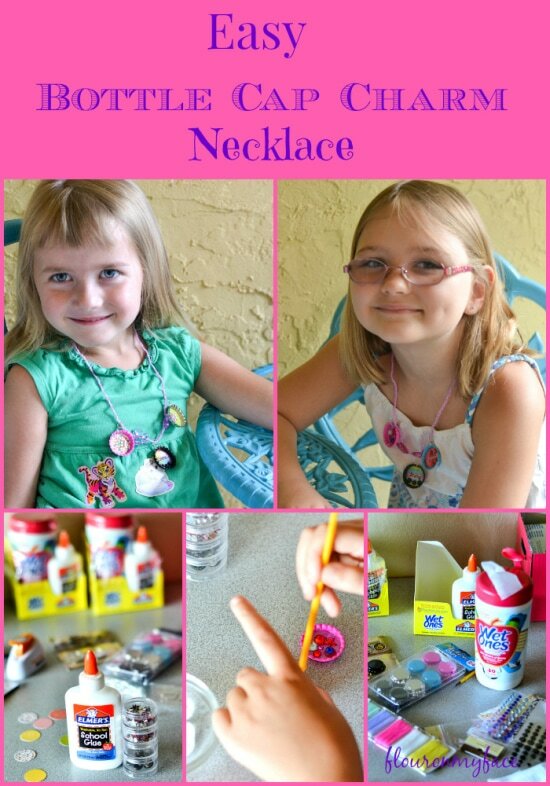 It’s up to you as to how complicated you want to get with making this kids necklace. For smaller children yarn and a knot will work. But to get the charms to hang on the necklace and face out you will have to have a metal jump ring. They are very inexpensive.under $2 a package. If you’d like to make refrigerator magnets instead attach a small magnet or magnet tape to the back of the bottle cap charm. 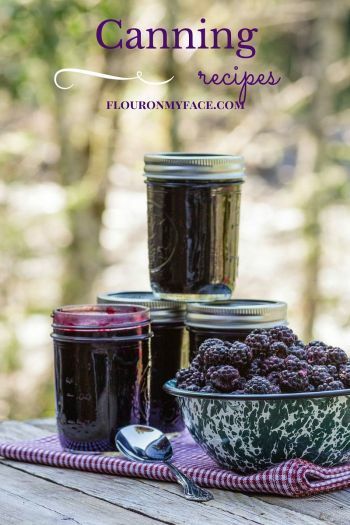 Need an easy summer craft for the kids? 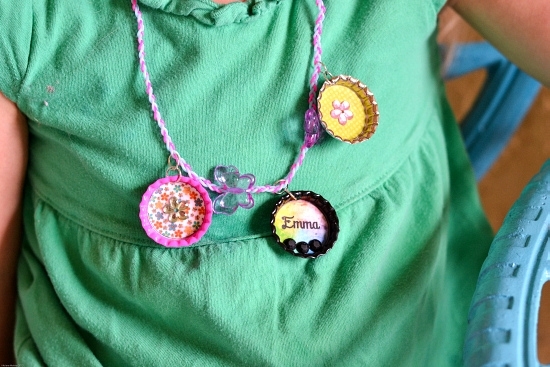 Easy Bottle Cap Charm Necklace is a great activity to keep the kids busy over the summer. 1 package bottle cap charms with holes for stringing on necklace string. 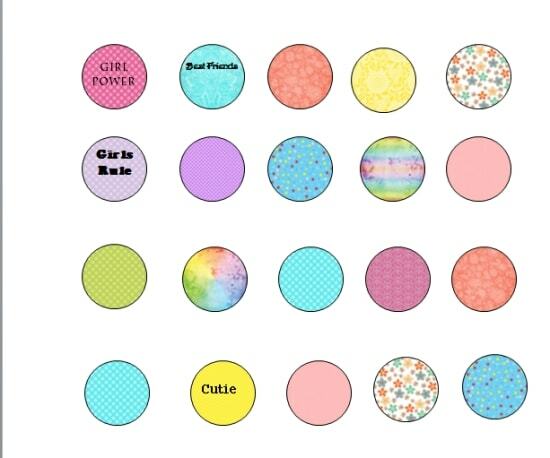 Punch out 1 inch circles from the printable or scrapbook paper of choice. Place a dot of Elmers glue on the backside of the circle and center the circle in the center of the bottle cap. 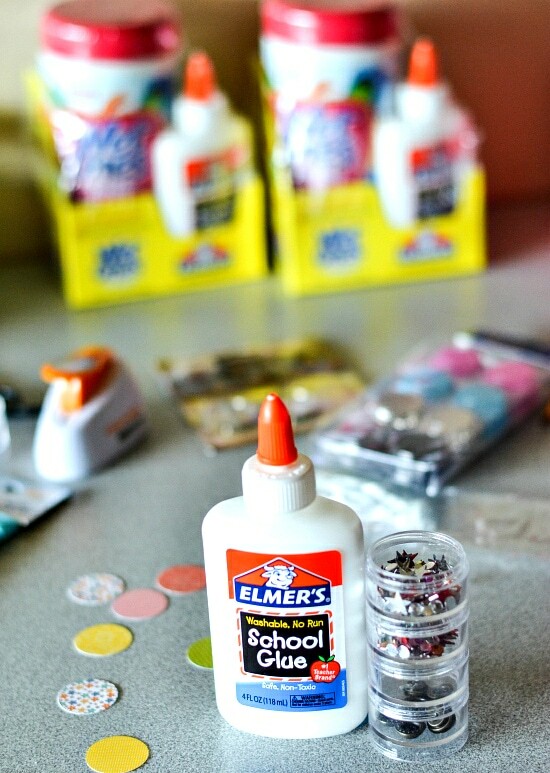 Using the Elmer’s glue use small charms, beads or buttons to embellish the background paper inside the bottle cap charm. When done embellishing paint a thin layer of glue over the inside of the bottle cap charm. 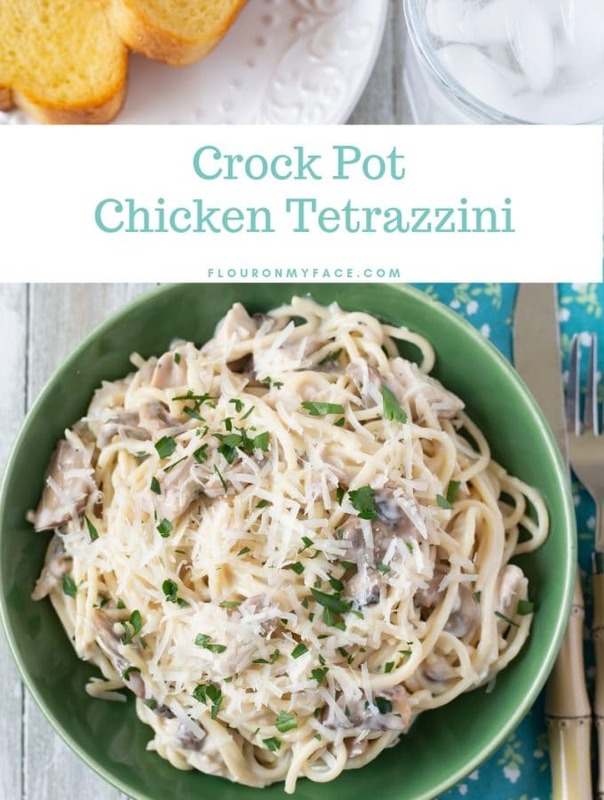 Hand from a necklace or add a small magnet to the back and use as refrigerator magnets.